Joining the family farming business starts at a young age in the Haun family. 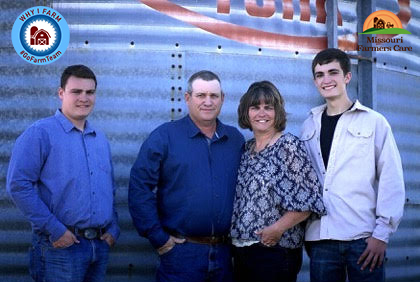 Tom and Misty Haun of Holden, Missouri raised their sons, Alex and Nathan, on Haun Farms located in Johnson County. All four of the family members have been involved in the operation ever since. Tom and Misty both agree that the farm is a family affair. Because of the dedication of the entire family, Haun Farms is able to produce corn, soybeans and wheat on 2,000 acres. They also own 200 head of cattle that make up their cow-calf operation. Alex and Nathan have also added their own specialized services to the family farm. Alex is a chemical salesman and will graduate from the University of Central Missouri with a degree in agribusiness management in May. Nathan currently does seed treating and is working to obtain his custom applicators license. Misty believes that getting started in the family business early has allowed Alex and Nathan to specialize and add their own businesses to the farm. The Haun brothers’ initiative is just one example of how Haun Farms operates on a shared passion for farming and a dream to continue the family business. Alex agrees that farming is what his family loves and will continue to do. Misty admits that farming wasn’t always her dream, but joining her husband’s family farming business changed that for her. The family business has grown with this passion for the industry since its founding over 100 years ago. It has also been named a Missouri Century Farm. Although the entire family shares a determined state of mind that plans to grow the operation and continue the farming tradition, they admit there will be challenges to overcome in the future. Misty agreed that the farm has a duty to inform consumers along the way. In addition to public perception, Tom thinks real estate prices will be a problem in the future as Haun Farms looks at expanding its operation by purchasing more farm ground. Whatever challenges the Hauns have to overcome, they plan to continue and grow the family farming operation. “We have been here a long time and don’t intend to go anywhere,” Misty said.